By: Liz Williams, KBO Education Specialist (AmeriCorps) This summer KBO is implementing its third season of aquatic bird surveys as part of the OregonCoordinated Aquatic Bird Monitoring Program. As part of this coordinated monitoring effort, KBO is focusing on seven species of marsh-nesting, colonial aquatic birds, including the Eared Grebe—Podiceps nigricollis. The Eared Grebe is the most abundant grebe species in North America, with an estimated population of 3.7 million. In its breeding plumage the Eared Grebe is black with chestnut flanks, bright white underparts and a scarlet iris. Its most distinguishable feature is a fanshaped, reddish-orange tuft that extends from the eyes to the back of the head. Eared Grebes typically winter in saltwater estuaries along the Pacific Coast and breed in freshwater habitats. In Oregon the majority of breeding areas are in Klamath, Lake and Harney counties, while breeding occurs in California in the east-central and northeastern portion of the state. Eared Grebes nest in large colonies, sometimes numbering in the thousands, in shallow water one to four feet deep. KBO survey crews have found Eared Grebes at more than 40 sites in southcentral Oregon. The status of Eared Grebes is of interest in the Klamath-Siskiyou bioregion in part because the region’s many lakes are subject to year to-year water level fluctuations which can impact Eared Grebe’s nesting habitat. Understanding water level impacts on Eared Grebes on their breeding habitats will be key to maintaining their abundance. Note: The Oregon Coordinated Aquatic Bird Monitoring Program is part of a large, multi-partner effort to determine the status of aquatic birds through the Western United States and to better inform waterbird management and conservation decisions. Source: Marshall, David B., Matthew G. Hunter and Alan L. Contreras, eds. Birds of Oregon: A General Reference. Corvallis: Oregon State University Press, 2003. This article can be found in KBO’s Summer 2010 Newsletter. Liz Williams, Education Specialist (AmeriCorps) The Horned Guan, a member of the Cracid family, can be found in the high elevation, subtropical cloud forests of the southern Sierra Madre Mountains of Mexico, and through the highlands of Central Guatemala. Named for the “horn” of bare red skin atop its head, it is an unmistakable bird. Its body is black with a bluish sheen, except for its breast, foreneck and a broad band at the base of its tail, which are all white. The bird has red legs, a yellow bill and white irises. Males have several vocalizations, including a deep low booming “uhmm, uh’mmm uh’mmm, uh’mmm uh’mmm,” while females have around seven distinct vocalizations which include snorts, clicking and bill-clacking. The guan’s diet is composed mainly of fruit, flowers and leaves. 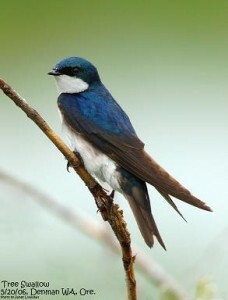 Beyond its diet, very little is known about the natural history or breeding biology of this bird. The Horned Guan’s subtropical cloud forest habitat in southern Mexico and Guatemala has been significantly reduced over the past several decades by extensive logging, firewood gathering, and forest clearing for agriculture. It is currently listed as Endangered by the International Union for the Conservation of Nature (IUCN). It is estimated that between 1000 and 2500 Horned Guans currently exist in the wild. Several symposiums have been held in Mexico addressing Horned Guan conservation, and conservation organizations in Guatemala are attempting to promote eco-friendly tourism focused on this unique species. Despite these efforts, its numbers appear to be declining. The protection of subtropical cloud forests in Mexico and Guatemala is of concern not only for the Horned Guan but for hundreds of other bird species. 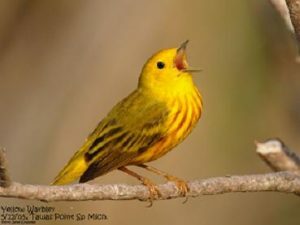 In fact, many species that we enjoy seeing in the Klamath-Siskiyou Bioregion in spring and summer, including the Hermit Warbler, Black-throated Gray Warbler, Yellow-rumped Warbler, and Yellow-breasted Chat will benefit from conservation of the subtropical cloud forest wintering habitats. All of us who celebrate the arrival of these migratory warblers in the spring should be concerned with the conservation of the Horned Guan and its habitat. References: BirdLife International (2009) Species factsheet: Oreophasis derbianus. (http://www.birdlife.org on 30/3/2010) This article can be found in KBO’s Spring 2010 newsletter. By: Liz Williams, Education Specialist (AmeriCorps) One of the first warblers to arrive in the Klamath-Siskiyou Bioregion of southern Oregon and northern California each spring is the Black-throated Gray Warbler. Starting in late March, you may see this elegant migrant, returning from its wintering grounds in Mexico. This striking species summers in a variety of habitats in the western United States and as far north as southwest British Columbia. Spanning thousands of miles and multiple cultures in its travels, this species is truly a “bird for all” in North America. This warbler is distinguished from its close relatives, Townsend’s and Hermit warblers, by its gray and white plumage, lack of yellow plumage except for a spot of yellow in front of the eye, and bold white wings bars. Identifying this bird by its’ song can be a challenge. Listen for a series of sharp, buzzy notes usually followed by a descending slurred note. This species is usually an active insect feeder of the mid-canopy. In our region, it can be found in a variety of habitats, from the canyon live-oak woodlands and chaparral habitat of the Klamath Mountains to the mixed-oak/conifer transition zone of the western Cascade foothills. The Black-throated Gray Warbler is often one of the last migrant warblers to leave its breeding grounds in the fall, so look for it in the region well into October. References: Birds of Oregon. Corvallis: Oregon State University Books, 2003. A Field Guide to Birds of North America (Peterson Field Guide Series). Boston: Houghton Mifflin Harcourt, 1997. This article appears in KBO’s Fall 2009 Newsletter. Lauren Kemple, Education Specialist (AmeriCorps) Wandering down the Bear Creek Greenway, a yellow flash of movement caught my eye. Stopping for a better look, I peered deep into the riparian shrubs. Yes, it was still there, skulking but only partially hidden. It had olive-colored wings and back and a yellow throat and breast. The bird’s belly was white, its tail very long, and the white “spectacles” around its eyes were quite distinct. This is my first year birding, and just as I was getting to know all the local birds, spring arrived with an influx of yellow confusion. So many migrants showed up, their warm colors seeming to carry the tropical climate of their wintering grounds into the Klamath-Siskiyou Bioregion. Determined to identify this bird, I pulled out my field guide and flipped through. Of course! It was a Yellow-breasted Chat, the very bird depicted through the art of Gary Bloomfield in KBO’s logo. Often found in willow thickets or bushy tangles, chats winter in the lowlands of Mexico and Central America and breed throughout the Eastern United States and various parts of the West, including much of northwestern California, eastern Oregon, and the Willamette, Umpqua, and Rogue River valleys. In California, where populations have declined in much of their historical range, the chat is designated as a Species of Special Concern. References: The Birds of North America Online (A. Poole, Ed.) www.bna.birds.cornell.edu/bna/species/575; The riparian bird conservation plan: a strategy for reversing the decline of riparian associated birds in California. www.prbo.org/calpif/pdfs/riparian.v-2.pdf. ; Peterson Field Guides: Warblers, 1997, Jon L. Dunn and Kimball Garrett. This article appears in KBO’s summer 2009 newsletter, click here to view the full newsletter. Lauren Kemple, Education Specialist (AmeriCorps) First you hear the high-pitched hum of his two inch wings, flapping 52 to 62 times per second. Then he zips past, a streak of bronze and green, tzzew zupity tzupity tzuping at another bird in aggressive defense of his territory. During the breeding season, this male Rufous Hummingbird will perform elaborate J-shaped diving displays to attract females.Often times indistinguishable from Allen’s Hummingbird, Rufous Hummingbirds tend to have more rufous-colored backs, though up to five percent of them are mostly green. Females have greener backs than males with rufous at the base of their tails. This “extremist” hummingbird migrates the farther north than any other hummingbirds in its family. Its journey is, relative to its body length, the longest known avian migration in the world! They spend the winters as far south as southern Mexico and breed throughout the Pacific Northwest, into Alaska. Spring migration seems to be timed to follow the blooming of flowers, leading them through California in March and April, north to their breeding grounds by mid-spring. Considered a valuable indicator species, the Rufous Hummingbird is viewed as a gauge of environmental health by researchers. Highly associated with western shrublands, they are also found in coniferous forests and riparian areas. Recent studies have shown a positive association with young broadleaf forests. Population trends for these birds are of high concern, with nearly a four percent reduction per year for the past 42 years. According to Partners in Flight North American Landbird Conservation Plan, the Rufous Hummingbird is of particular concern due tovulnerability from a limited non-breeding distribution as well as a limited breeding distribution. The continental objective calls for an emphasis to increase this population by 100%. Along with Partners in Flight, the Western Hummingbird Project addresses hummingbird conservation issues in North America through habitat restoration and enhancement, monitoring, research, and education and outreach. KBO contributes to this project through collaboration with the US Forest Service Wings Across the Americas Program, the Hummingbird Monitoring Network, and many partners. References: Partners in Flight North American Landbird Conservation Plan, 2004, by Terrill Rich et al. ; The Birds of North America, first edition 2005, edited by Dr. Alan Poole and Dr. Frank Gill. This article appears in KBO’s Spring 2009 newsletter.